A volcano has erupted in southern Chile, scattering ash over the surrounding area and forcing more than 4,000 people to leave their homes. The eruption of the Chaiten volcano caught local authorities by surprise, as experts say it has been dormant for more than 9,000 years. Chile's national emergency office said that the volcano was continuing to register activity on Saturday. Sick and elderly people have been evacuated from Chaiten, six miles away. About 500 people were still waiting to be evacuated by boat. Residents have been told not to drink the water, because the reservoirs in the area are covered in a layer of ash. Chilean officials have distributed fresh water and protective masks. Local hospitals have treated people for breathing difficulties. The eruption also dumped a layer of ash in neighbouring Argentina, forcing the closure of schools and a regional airport. Chile is one of the most volcanic countries on Earth, with more than 100 active volcanoes. 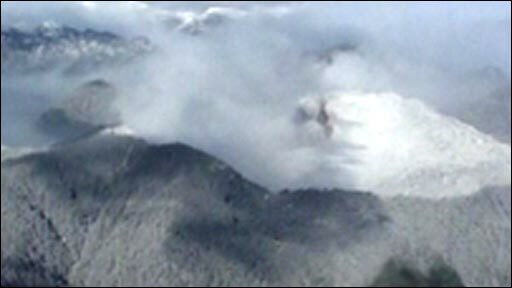 Of those, experts say about 20 are in danger of erupting at any time.